Objective: The Brand has embarked on a social mission of educating, engaging & inspiring children to practice good hygiene. The Goal is to have all 2 million children across the Gulf aged between 4-12 yrs of age to have zero cavities and zero germs by year 2020. 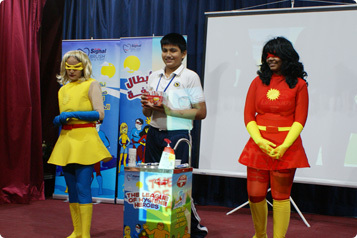 What we do: Educate children to practice good hygiene with the help of an animated video, mascots & role play. We demonstrate the patented ‘Glow Germ test’ and the correct way to wash your hands & mouth.